A Squirrel Baffle blocks squirrels from bird feeders and makes them squirrel proof. There are different styles and uses of Bird Feeder Baffles. Squirrel Baffles can stop attacks from above and Pole Squirrel Baffles block squirrels from below. Hanging Feeder Baffles are used on bird feeder poles more as weather baffles. Hummingbird Baffles are used to divert weather and sun from Hummingbird feeders to keep nectar fresh. Click the different sub-categories to view more of each class. Don't miss out! 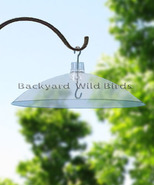 CLICK ON EACH PICTURE TO SEE ALL THE STYLES OF BIRD FEEDER BAFFLES .